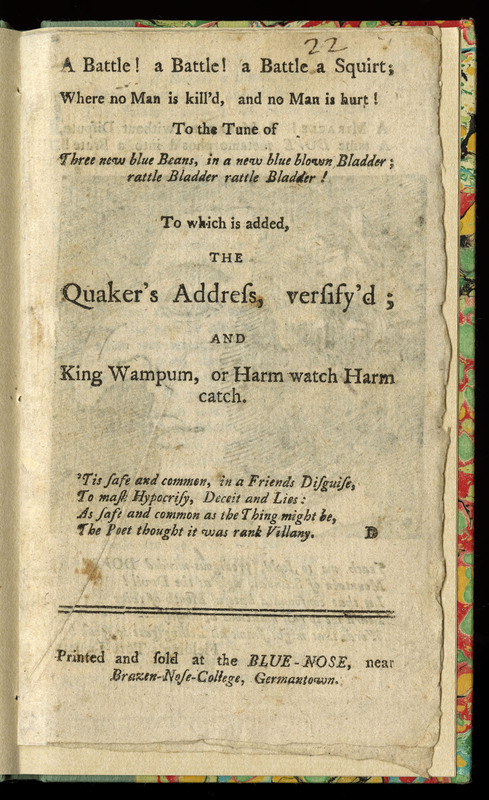 An early thread of the Pamphlet War was the critique of Quaker native diplomacy during the Seven Years’ War. Critics charged that Friends were opportunistic, or, worse, immoral, in their dealings with natives. Perhaps most egregious was the fact that some Friends enlisted in a militia to defend the Philadelphia from the Paxton marchers. 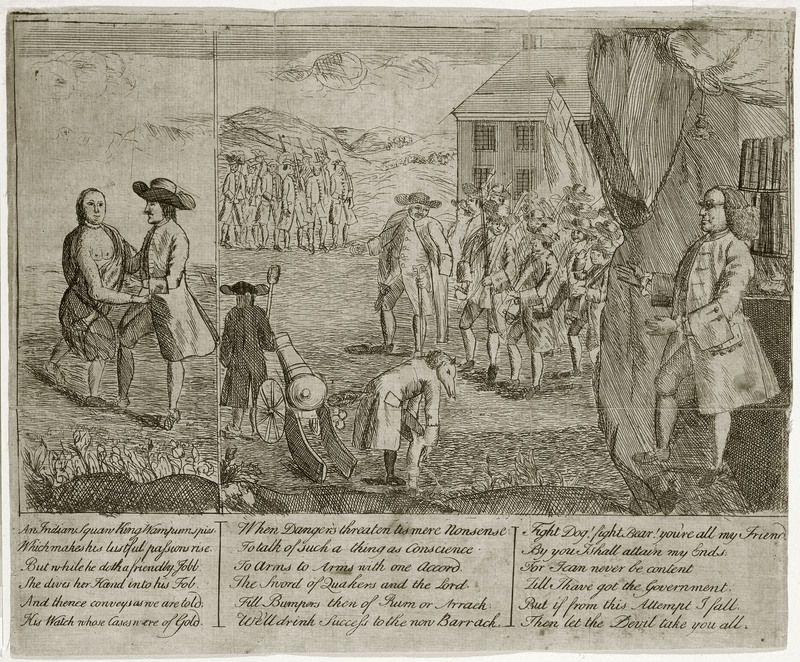 Given the Society’s resistance to the organization of a militia during the Seven Years’ War, critics charged that the Quakers would take up arms to defend the colony’s natives, but not their fellow settlers. 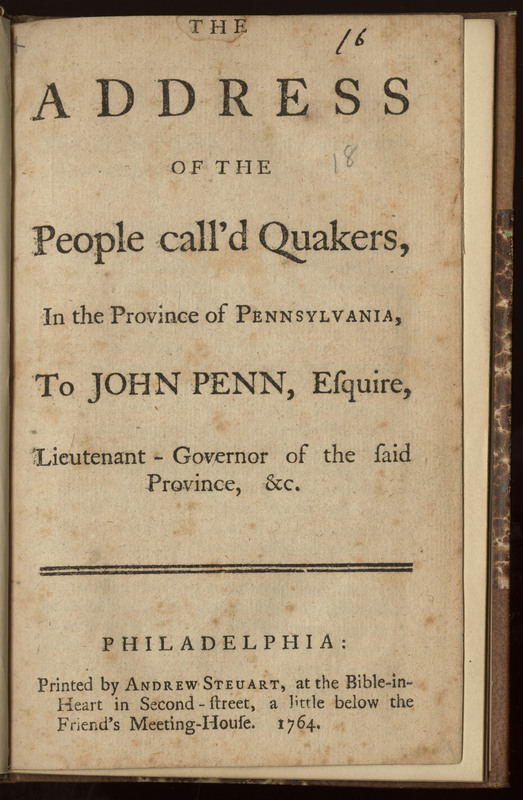 The Philadelphia Yearly Meeting, The Address of the People Called Quakers (Philadelphia, 1764). 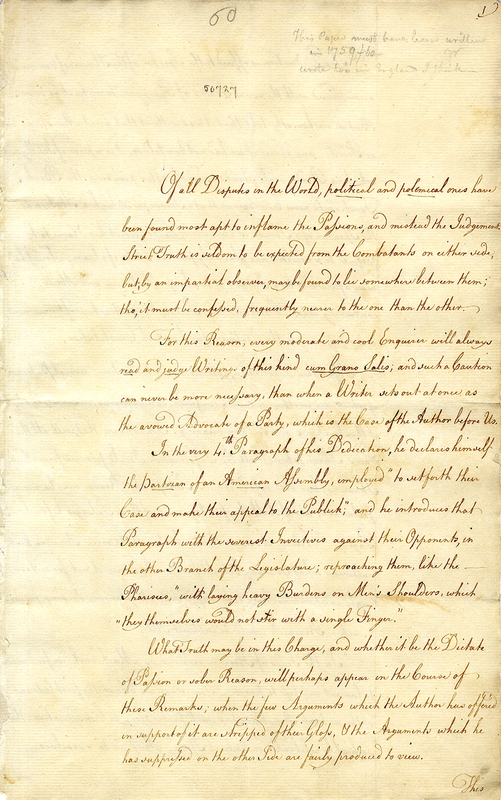 In this letter to the governor, the Philadelphia Yearly meeting warned that Smith’s pamphlet would agitate “the inconsiderate Part of the People” against the Society. 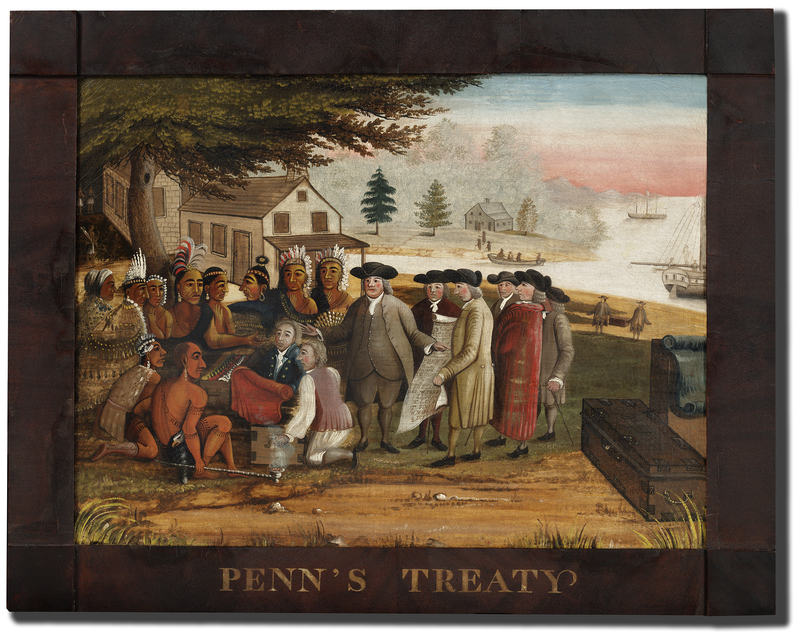 Those fears proved well-founded as Paxton apologists conflated Quakers with the warring Indians that they claimed had precipitated the march. David James Dove, A Battle a Squirt; Where No Man is Kill'd, and No Man is Hurt! (Philadelphia, 1764). This pro-Paxton pamphlet was published anonymously, but later attributed to David James Dove, the infamous satirist, Paxton sympathizer, and headmaster of the Germantown Academy. (The printer included an unflattering engraving of the doctor.) Dove counters Address by mocking Friends’ superficial adherence to the peace testimony, which he argues they relinquished all too quickly stymie the Paxton men during their march to Philadelphia. He describes the Paxtons, meanwhile, as the “worthy bleeding Men of Paxton,” whom acted to prevent Indian treachery. James Claypoole, An Indian Squaw King Wampum Spies (Philadelphia, 1764). In this pro-Paxton political cartoon intended to accompany Battle, a Quaker merchant identifiable as Israel Pemberton (“King Wampum”) cavorting with a partially undressed native woman who is stealing his money. A bespectacled Franklin watches from the right.